NEW YORK TIMES BESTSELLER "A brilliant book, wise and nuanced." -Nicholas Kristof, New York Times "Comprehensive, enlightening, and terrifyingly timely." 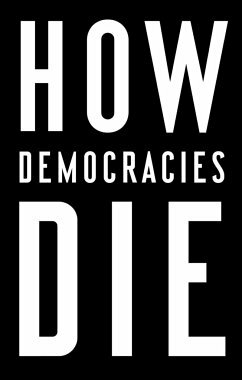 -New York Times Book Review "Cool and persuasive... How Democracies Die comes at exactly the right moment." -The Washington Post Donald Trump's presidency has raised a question that many of us never thought we'd be asking: Is our democracy in danger? Harvard professors Steven Levitsky and Daniel Ziblatt have spent more than twenty years studying the breakdown of democracies in Europe and Latin America, and they believe the answer is yes. Democracy no longer ends with a bang-in a revolution or military coup-but with a whimper: the slow, steady weakening of critical institutions, such as the judiciary and the press, and the gradual erosion of long-standing political norms. The good news is that there are several exit ramps on the road to authoritarianism. The bad news is that, by electing Trump, we have already passed the first one. Drawing on decades of research and a wide range of historical and global examples, from 1930s Europe to contemporary Hungary, Turkey, and Venezuela, to the American South during Jim Crow, Levitsky and Ziblatt show how democracies die-and how ours can be saved. Steven Levitsky and Daniel Ziblatt are Professors of Government at Harvard University. Levitsky's research focuses on Latin America and the developing world. He is the author of Competitive Authoritarianism and is the recipient of numerous teaching awards. Ziblatt studies Europe from the nineteenth century to the present. He is the author, most recently, of Conservative Parties and the Birth of Democracy. Both Levitsky and Ziblatt have written for Vox and The New York Times, among other publications.